A good facial is the key to a healthy and rejuvenated skin. The best thing about facials is that it is a simple process that gives a bunch of benefits to your skin. Facial can easily give you a fresh look that you are sure to cherish. The only thing about facials that you might not like is the part of going to a salon to get the facial done and spending your hard earned bucks on it. So, we have an easy idea here, do your facial at your home and enjoy the same benefits. Completing a facial at home is not difficult. All you need is the right Step by Step Guide to Completing a Facial. You can even get an electrical facial just like the high end spas at home if you own the right gadgets. The best thing about getting a facial at home is that it leaves you with the option to use completely natural products, which might not be available at the spas. Without elaborating any more on the benefits of getting a facial at home, we will directly move to the Step by Step Guide to Completing a Facial. Every spa maintains their secret formula when it comes to a facial. They will hardly ever let you know the exact products and ingredients they are using to pamper your skin. There are also different varieties of facial available. Starting from pearl and diamond facials to chocolate facials, all are popular now. Before getting a facial it is important that you are aware about the particular needs of your skin. So that you are able to customize your facial according to your skin needs and get the best effects. If, you are getting a facial done at the parlor, then also, talk with the beautician about your skin conditions first before choosing any of the available facial types. Mild facial cleanser (you can use your regular face wash if you have an oily skin. If you have dry skin, it is best to opt for cleansing milk instead of a face wash). Take half of a cucumber, half of a ripe banana, few cubes of ripe papaya, half of an apple, few black grapes and half of a tomato. Wash all these fruits clean with plain water. Take all these ingredients in a pressure cooker, burn the gas and close the lid. Remove the cooker from the oven after 5 minutes and open the lid once it is cold. Take out the fruits and smash them to make a paste. Now add 1oz brandy to it and mix again. Leave it for 30 minutes and then squeeze out some juice from this paste but do not leave the pack completely dry. Store the juice in a clean container with a lid. Add 2 spoons of finely grounded fuller’s earth to the pack and mix well. Your homemade mixed fruit facial pack is now ready. The first and one of the most important steps of a facial is cleansing the skin properly. Unless your skin is well cleaned, a facial can never give the best results. In fact, applying the massage cream over an uncleaned face will even multiply the chances of a break out. So, take due care to cleanse the skin thoroughly before you move to the next steps. Apply a mild face wash or cleansing milk on your face and massage it gently on your face. If you are using a face wash, do not keep it for long on your face. However, if you are using cleansing milk, you should massage it more on the skin and then only remove with damp cotton pads. Repeat the wiping off once again just to ensure that no trace of dirt or grime is left. Scrubbing makes one of the most vital steps in the Step by Step Guide to Completing a Facial. It might really look simple to just scrub your face, but this simple process has a very crucial role to play by removing all the dead skin cells from the skin. It is suggested to pick a good quality branded scrub for the best results. Charcoal scrubs from the renowned brands or high quality walnut scrub can serve the purpose. Apply the scrub all over your clean face and then rub it gently on the skin in circular and upward motion. There might be enough moisture left on the skin from the previous step that you will not need to add any more water to the scrub to make it roll smoothly on the skin. If not, then wet your hands in clean and fresh water to continue the scrubbing. Make sure that you are not rubbing the scrub on dry skin. After you have scrubbed the skin gently for 2 minutes, remove it with damp cotton pads. Repeat the wiping off once again with fresh and damp cotton pads. After scrubbing your face and removing the scrubber completely, now it is time for steaming. If you have a facial steamer, keep it prepared before you start the facial and now just switch it on so that it starts to produce vapor. If you do not have a facial steamer, take sufficient warm water in a wide mouth pan and take the steam on your face covering your head with a towel. You should take the steam for 5-8 minutes depending on the sensitivity of your skin to heat. Moist heat helps in opening the skin pores making it much easier to remove the impurities from deep within. Many parlors also opt for steaming before using a scrubber. However, when you are doing it at home, scrubbing your skin before steaming can be safer. 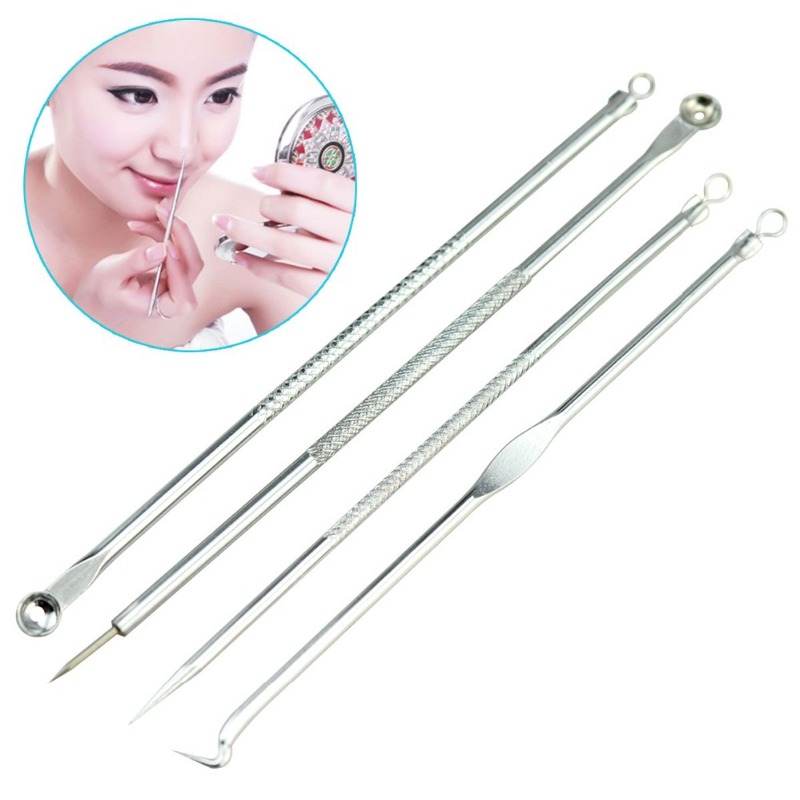 This is the step when you need to use the specialized tools to extract the plugs from the skin pores. As your skin has been freshly scrubbed and steamed, hence removing the blackheads and whiteheads will be much easier now. Take your time to remove the impurities completely from your skin. Blackheads and whiteheads are most common near and on the nose and also on the cheeks and forehead. So, remove them completely with the précised extraction tools. Now it is time to pamper your skin. Facial massage done in the right way with the right products can give you ample benefits. It helps in better penetration of the skin care products and also promotes blood circulation on the skin. Professionals prefer using different types of facial massage creams to suit the different needs of the skin. Using an almond massage cream along with a cucumber massage cream can be a good option to get the best results for any skin type. Start with the cucumber massage cream. Apply the cream on the dry face and then take some of the liquid extracted from the face pack prepared previously on your hands. Now massage the cream on the face in upward motion with the fruit pack extract. You should continue the massaging for 5-7 minutes. If you are using two different massage creams, then you should wipe off the first cream with damp cotton pads before applying the second cream, the almond one. Massage the almond cream on the face with the fruit pack extract collected previously, in the same way as before. Make sure that your hands move on smoothly on the skin always. If needed, take more of the liquid extract. After massaging for 5-8 minutes, remove the excess cream with damp cotton pads. The fresh fruit face mask gives a boost of nutrients to the skin and also helps in skin toning. After you have removed the massage cream with cotton pads, apply the mixed fruit face pack prepared previously on to your face. You might need to use water soaked cotton pads for bordering your face, so that the mask holds on properly. Covering your eyes with pieces of cucumber, after applying the face pack can be a good idea to ensure that your eyes look rested and the dark circles are gone. Leave the pack on for 20 minutes and then remove. Finally wipe your face with damp cotton pads before proceeding to the last step. In the last step of a facial, you can either use a facial gel or a face serum to meet with your particular skin needs. You can also use a face gel made from Vitamin E and Aloe Vera to complete the facial. In most of the high end salons a special type of facial gel is used which work as their trade secret. 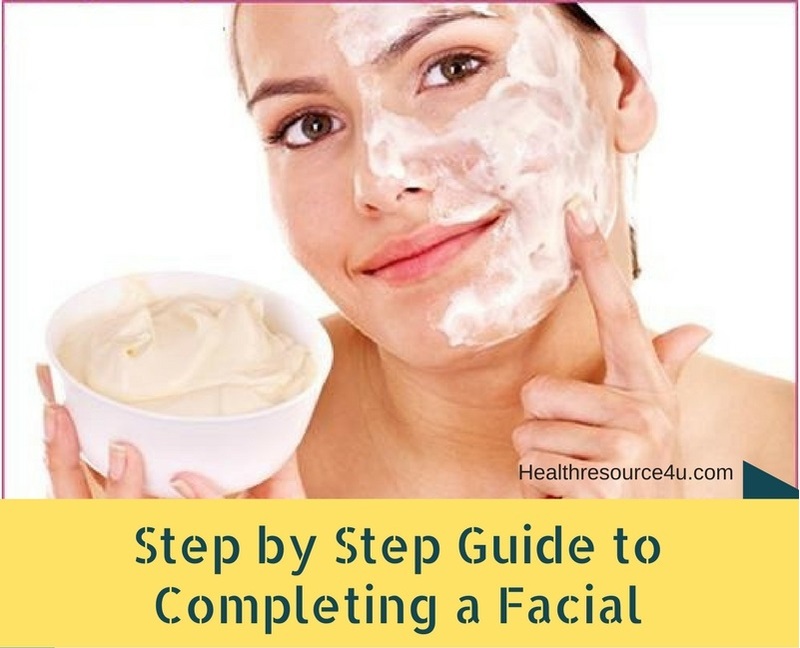 Now you have a thorough Step by Step Guide to Completing a Facial. So, wait no more and start doing your facials at home at least twice a month. Regular home facials can give you remarkable results. It can easily keep the signs of aging at bay giving you a fresh looking skin always. After completing the Step by Step Guide to Completing a Facial, now we will take a look at few case studies, just to be sure about how this facial can transform the skin. However, it is not a magic and to get the best long term results, it is important that you follow the steps accurately and religiously at least twice a month. However, as soon as you are done with the facial, you can see the glow on your face instantly. Extremely dry skin that used to become really rough and patchy during winter was the primary complaint of this 25 years old girl living in Virginia. She had tried various moisturizers that claim to soothe the skin but the effects in every case were temporary. It was not possible for her to opt for regular parlor treatments, because she was busy in making her career. Finally she opted for the facial at home following the Step by Step Guide to Completing a Facial and started to see changes in her skin right after the first time. 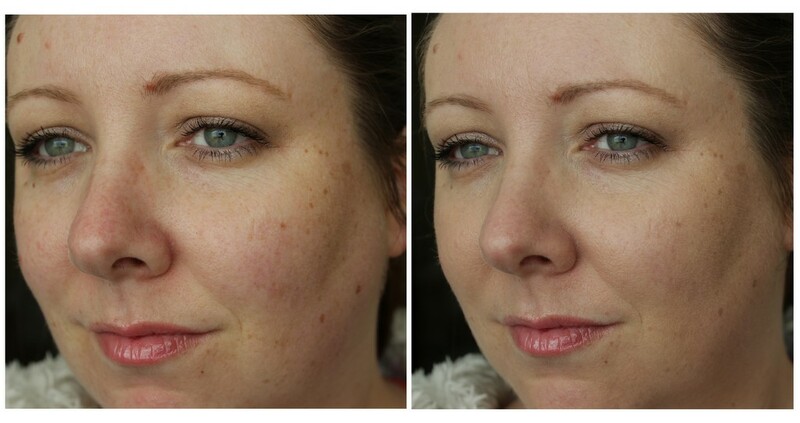 The second picture was taken 6 months after she started with the home facial. She no more has the complaint of skin dryness or dry patches. How her skin has improved in the last 6 months is evident from the second picture. This 32 years old lady wanted to ensure that her skin looks youthful even after she had crossed the bar of 30. She maintains a busy professional life along with a load of personal responsibilities and hence it was not possible for her to visit the beauty salons regularly to get facials done. She started with the in-home facial following this step by step guide. Within months she was able to see the changes in her skin. 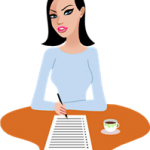 Her fine lines and wrinkles were now softer and the dryness of her skin was gone too. Now her skin looks and feels more youthful which makes her even more confident about herself. This 40+ years old lady had dry skin which was getting even drier with age. She also had prominent smile lines that gave her face a more aged look. Redness and open pores were the other skin concerns for her. A beautician suggested her to opt for regular facial treatments, but she was not able to follow that religiously due to her other commitments. Finally she started with the Step by Step Guide to Completing a Facial as it was much easier for her to follow the steps at home at her own pace and time, instead of rushing to a parlor. The changes in her skin condition were not very quick. She was only able to see her dry spots gone at first. After following the facial routine step by step for around 4 months she was able to spot improvements in the wrinkles. The second picture were the lady has a much better skin with softer wrinkles was taken around 1 year after she followed the step by step facial guide religiously for the whole year. 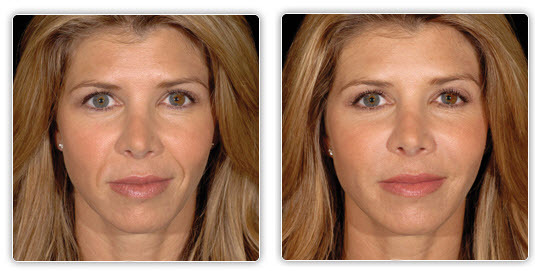 This case study involves a 35 years old lady with facial features that make her look much younger than her actual age. The redness of her skin and brown spots on the cheeks were her main concerns. She was suggested to opt for regular chemical peels to reduce the appearance of the brown spots on her face. However, as she has very sensitive skin, hence she was not keen to opt for the chemical peel treatments which might have exaggerated the skin sensitivity. Finally she got to know about the benefits of doing regular facials and she followed the Step by Step Guide to Completing a Facial religiously. She was able to spot the difference only after 3 months of doing the facial twice a month. Currently she has reduced the frequency of the facial to once a month and still she has no complaints about any skin issues. The subject of this case study is a 18 year old teenager. She had naturally beautiful skin but it was the skin dryness that was making her worried. During winter months her skin used to become extremely dry and no moisturizer was able to help. There were also some pimple spots on her forehead. She was a bit worried to opt for the parlor treatments because she thought it was too early to start a regular parlor regimen. She followed this Step by Step Guide to Completing a Facial and started seeing improvements in her skin condition instantly. However, it took around 6 months of religious following of the routine to get rid of the spots on her forehead. Her problem of dry skin was also resolved and currently she enjoys beautiful and glowing skin, which is natural for her age. Question #1 How frequently should I opt for the facial? It is best if you can do this facial following the steps as mentioned above, once in every week. However, if that is not possible you should at least take this facial twice a month until your skin problems are resolved. Once the problems are resolved, you can reduce the frequency to once in a month. Question #2 How long it takes to complete this facial at home? Including the time taken for preparing the face pack and making the arrangements, you can complete the total process easily within an hour. However, if you chose to give some gaps in-between steps or to keep the massage creams on the face for a bit longer before wiping them off, it might take 5-10 minutes more. Question #3 How quickly I can start seeing results? There are many who have seen improvements in their skin concern just after a single facial following the Step by Step Guide to Completing a Facial. However, it is important to keep in mind that the effectiveness of this treatment completely depends on the particular skin concerns, age of the person as well as how religiously the process is followed. Question #4 Can I follow this regimen if I have sensitive skin? This regimen is safe for all skin types. However, if you have extremely sensitive skin, make it a point to use a very mild cleanser and scrub that are ideal for your skin type. Also do not massage your skin for longer than 5 minutes at a stretch. Skip the brandy while preparing the face pack. Question #5 Are there any risks involved in this facial? This facial is completely safe and does not involve any risk. However, always make sure that you do not scrub or massage the area surrounding your eyes roughly or for long. If any of the products get into your eyes, wash thoroughly with plain water. Also maintain caution while taking steam and make sure that it does not scald your face. Question #6 Are there any after cares of this facial? There are no particular after cares for facial. Just make sure that you do not use any kind of peel or scrub on your face for the next two days. Also do not opt for waxing after you have done the facial. For cleaning your face use cleansing milk instead of a face wash for the next two days.